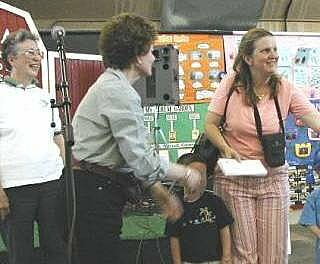 (April 26, 2004) -- Students and their classes at two ELB schools -- a pre-K class at Newcomb Academy for Academic Excellence and a Kindergarten class at Prisk Elementary School -- have won awards at the Schools' Involvement Fair sponsored by the State of CA's 48th district Agricultural Association. 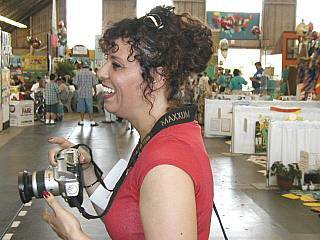 The awards, won in competition with other area schools, were handed out on April 25 at the L.A. County Fairplex in Pomona. Teachers Crane and Kelly along with several students and family members met in Pomona on a 96 degree day (even hotter inside Exhibit Building 22) where they learned they'd won blue, red and other ribbons. Mrs. Crane accepted the awards for her class at Newcomb and participating students. 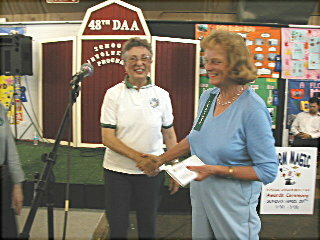 Prisk teacher Donna Kelly accepts the awards for her pupils and class. 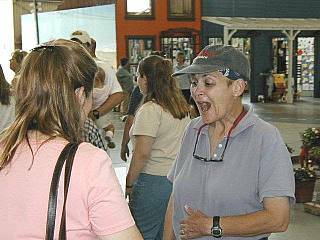 Mama Sharon reacts as she learns her son won a ribbon. Mama Audrey of another Newcomb student beams with pride. 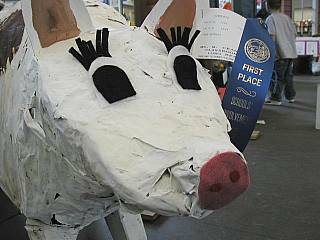 Mrs. Crane's Newcomb class won a blue ribbon for this pig. 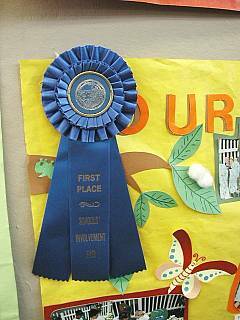 And this blue ribbon went to Newcomb for an educational display. 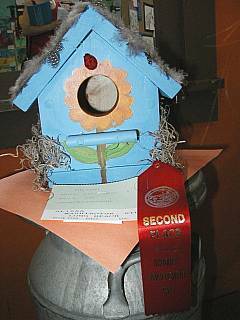 A Prisk student got a second place red ribbon for this bird house. 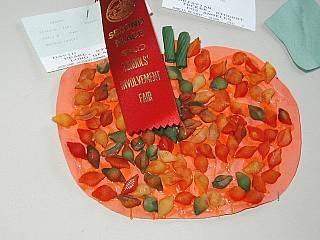 And a Newcomb student won second place prize for this creation, made in part with pasta shells. 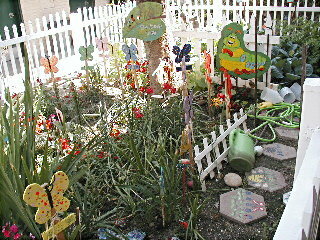 Among the 1st place winners was this garden on the Newcomb campus tended by Mrs. Crane and her students. 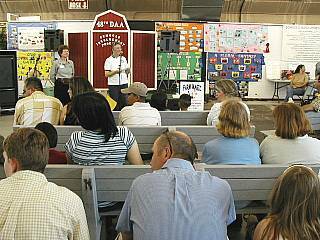 The 48th District Agricultural Association, which conducted the event, is a state entity...one of 78 fair districts statewide. As described on its web site (www.schoolsinvolvement.com), the Schools Involvement Program's vision is "to be the premiere institution supporting agricultural literacy in the Los Angeles Basin" with a mission to provide "primarily elementary and secondary teachers and students an understanding of and appreciation for the role of agriculture in an urban and suburban society." "We have assembled teaching materials from diverse sources, and purchase or receive donations of books, hydroponics materials, bread kits, incubators and aquariums and chillers. Our resource center provides a one-stop shopping center for teachers - materials for about 60 projects in one place- so they can select a project that coordinates with what they are required to teach in their grades. 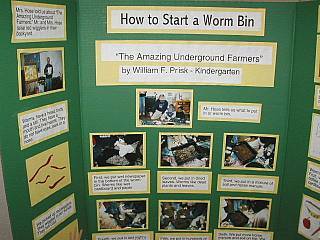 We provide workshops of hatching chicks, silkworms or trout- on composting or planning and planting a garden. Most projects are adaptable to a variety of grade levels. Everything we give is free, in exchange for an exhibit to be displayed at our annual fair," says www.schoolsinvolvement.com. 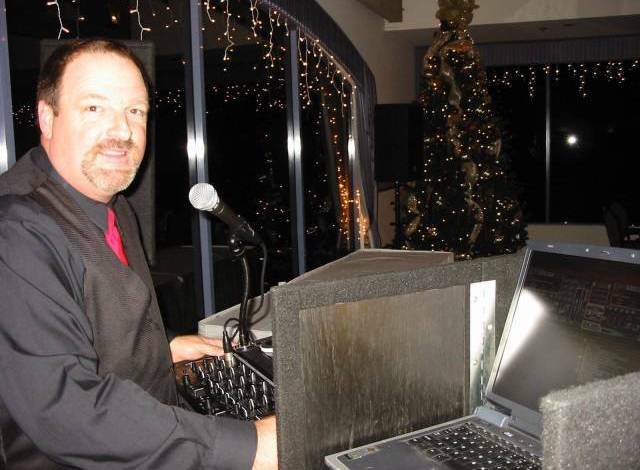 "This program is important to continue the agricultural heritage of our area and our state. It teaches students that food doesn't come from a grocery store, but from a farm or a garden, a plant or an animal-that the cotton in their T-shirts grew on a plant and the wool in their blanket began with a sheep. Our dream is to give every student in our district the knowledge of the importance of agriculture in all of our lives," the web site adds.